In 6&apos;s:pass,set, pass, follow. Focusing on the quality and pace of the pass and the timing and arced run from the midfielder who receives the set pass. opens out and plays a square pass to the man in the other group. 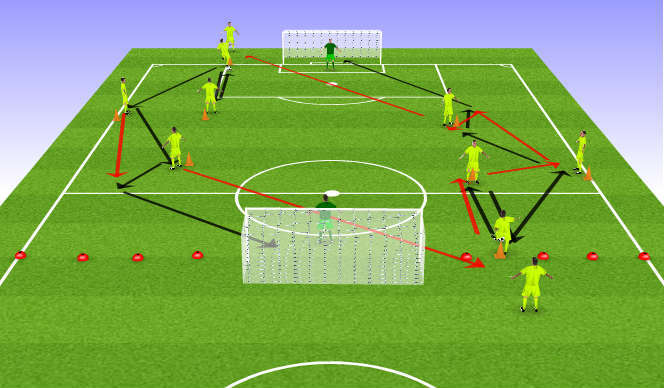 Shooting practice with various passing and receiving combinations. Pass,set,okay to the winger, he then plays into the front man who sets back for him to shoot.All rotate. Focus on neatness of passing and checking away and quality and correct technique of strike. Players can not come out of there half unless they have passed the ball in or dribbled the ball in. which then makes a 3 v 2 overload. Encourage getting on the half turn to shoot if there is space or setting back for team-mate to shoot. Players on the outside are feeders and have two touch max. Working with the strikers. 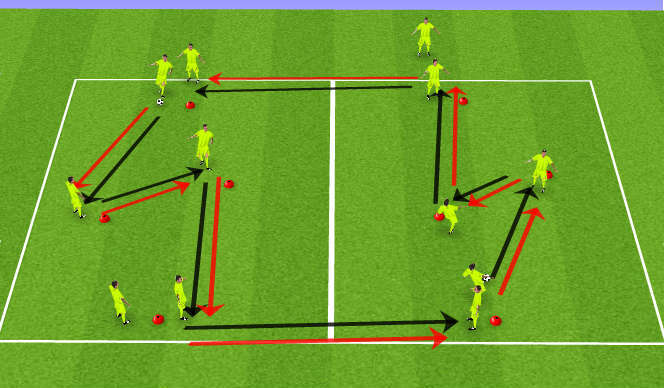 Set practice up so it is 1-2-3-1 v 4-2. Work on movement of strikers and support of team-mates. Get on the half-turn if possible and be ruthless in and around the box.